Global Strategies, working with Femme Plus in the city of Bukavu, Democratic Republic of Congo, is using an innovative map to help patients find the help they need. The goal is that the same day a patient receives a diagnosis of HIV, he or she can be directed to a nearby support group. 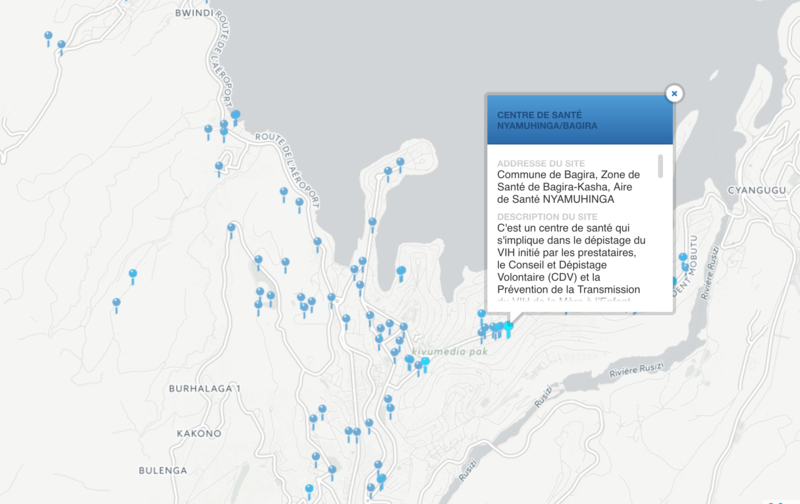 Beginning in 2014, Femme Plus has already mapped 43 sites that provide care to individuals living with HIV in the city of Bukavu alone. The Femme Plus team members, equipped with tablets and trained by Global Strategies in taking GPS coordinates, visit care programs and inquire about the services available. They then complete digital questionnaires, get a GPS tag on location and then transmit the data to Global Strategies. Back in the USA, the data is entered into an online cartography program and a link to the map is sent back to Congo. Ultimately, Global Strategies plans to train the local team in the map-making software as well. Global Strategies helps us to take care of sick babies, helps us to take care of babies who are infected by HIV to help them become useful people for their country.